Yes, it’s that time of year! 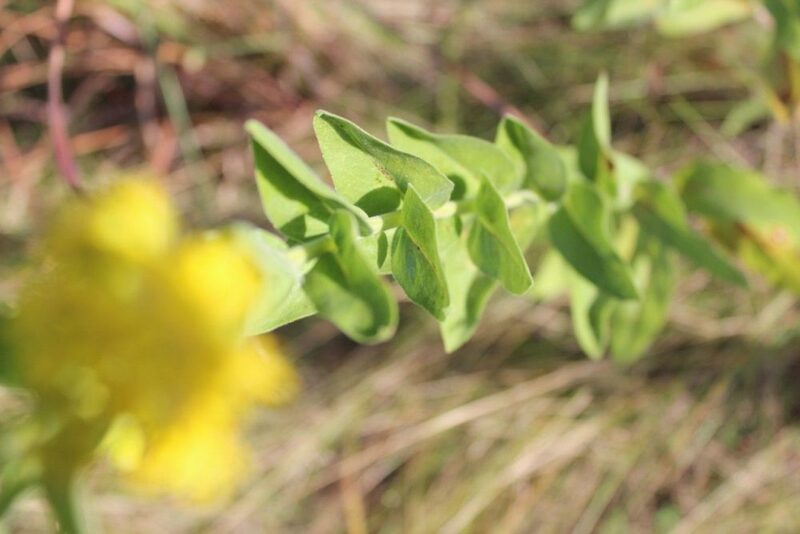 People see yellow flowers blooming and blame the poor goldenrod for all their allergy misery. The goldenrod plant/flower is guilty by association. It grows at the same time, often in the same location. 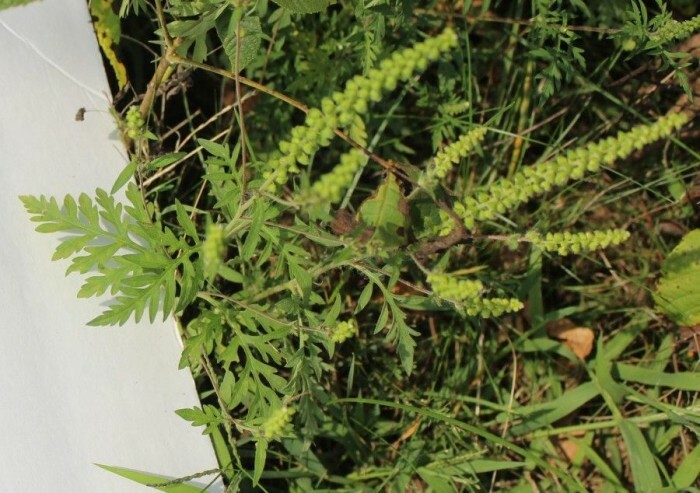 It’s important to be able to identify the difference between Ragweed and Goldenrod so that the wrong plant isn’t blamed or destroyed because of someone’s allergies. SNEAK PEEK – this is ragweed!! I spent about 1 1/2 hours trying to find a website that showed clear and concise pictures to help me figure out the difference. I had heard that the yellow blooming flowers we see are goldenrod and not ragweed. But, if that was true, I had no idea about what ragweed looked like. Even when you Google ‘ragweed’, pictures of goldenrod come up and I know that’s incorrect! Ragweed is out there now though. The sinus headaches I’ve been waking up with every morning for the last couple of weeks prove it! This is not a local goldenrod but does grow in our subdivision. That would be because when our developer planted wild flowers and grasses in some of our common areas. It’s amazing how difficult it was to get a definite picture and a confirmation of ragweed. I talked to a few fellow gardening friends. We speculated and looked at plants and finally came up with one that we thought was ragweed. I took pictures and asked a local nursery to confirm that I had indeed taken a picture of the right weed. After two weeks and hearing a debate in a back room, they let me know they weren’t sure. These are plant people!! I started buying more of my planting material elsewhere. A closeup of a goldenrod flower. There are a few different types of goldenrod so not all look exactly like this. 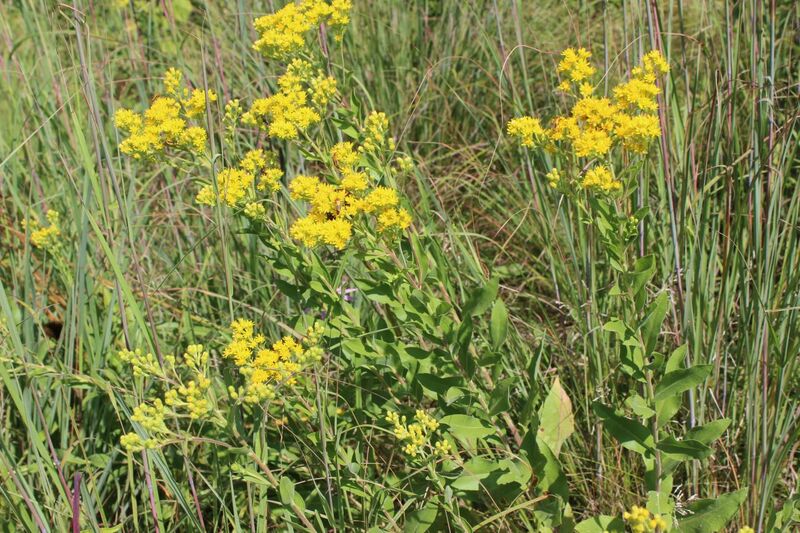 Here is a picture of the more common goldenrod that we see locally here in Wisconsin. This is goldenrod, not ragweed! I was put in touch with Mike, who is an instructor at the Mequon MATC. 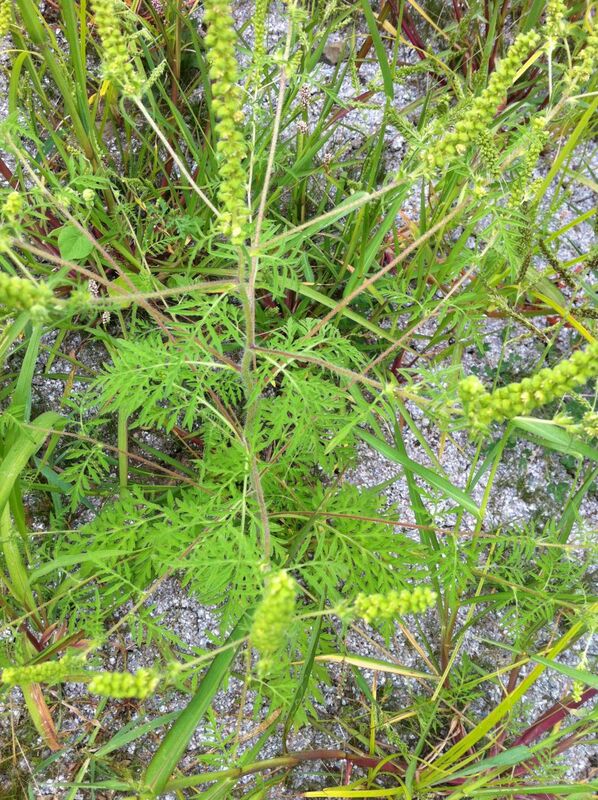 Poor Mike has had the pleasure of me sending multiple e-mails with pictures all asking, “Is this ragweed?” Finally success. This is ragweed. It’s very different from goldenrod. Look at the flowers. They are not bright yellow like goldenrod. Also, this plant was less than a foot high. It was growing close to a patch of goldenrod. This next picture is a close-up of the leaves. This is a good way to tell the difference. I was told to look for ‘ferny type leaves’. And, yes, that’s a great way to help figure out what is what. Hopefully, I’ve shown you the differences between goldenrod and ragweed well enough in my pictures! 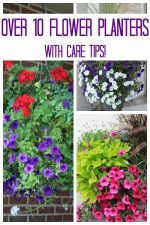 Keep in mind that there are different varieties of both plants, but, my pictures should be a good guide. Remember, look at the leaves, that should be your best indication that the plant is ragweed. I’ve added more pictures. 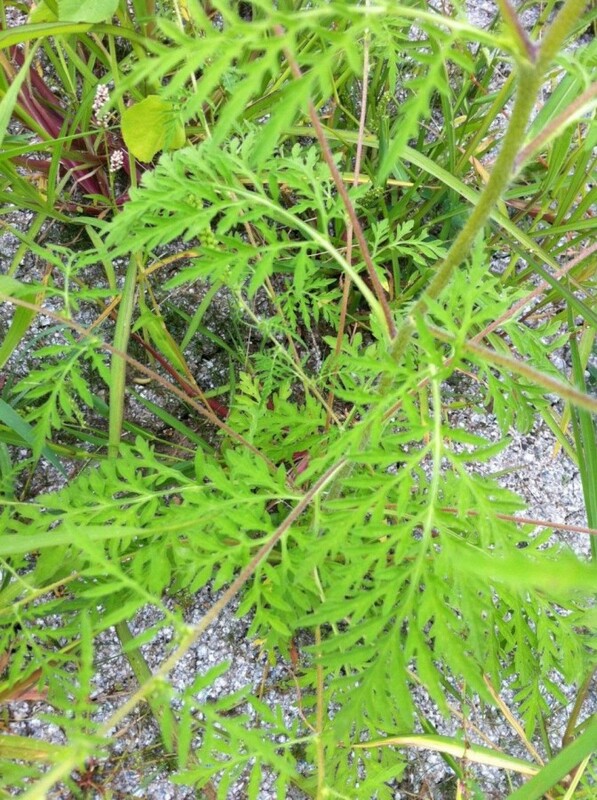 So many of you have visited this blog post looking to figure out what this weed looks like. These next picture is e a ragweed plant that I found in shadier conditions. 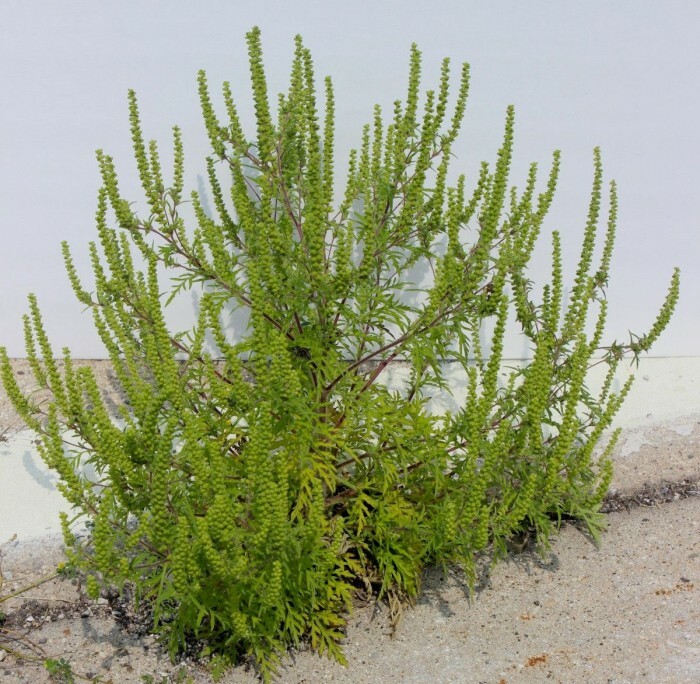 I hope these pictures of ragweed help you identify this weed that everyone is allergic to. Let’s stop blaming the poor goldenrod plant for our allergy ailments! 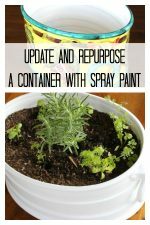 « Painting Preparation Tips (I spied on my professional painters). Goldenrod leaves are one of the few plants my dog noshes on sometimes. Next, to notice what the other one is, besides grass. Thanks for verifying my guess about this one. I wonder what’s in goldenrod that makes him eat it? Thank you for the pictures so I can tell the difference! That is a big help! I am an Ohio beekeeper. Every year about this time I am delighted to see the beautiful goldenrod “weed” appear in the yards and along the roads. This is one of the main sources of pollen before winter storage for my ever-challenged honeys. Thank you for providing visuals of one plant to LET GROW! God bless. Your blog confirmed what it has taken me soooo long to figure out —just look at the leaves!!!!! Thank you. Now my newest project is to get better at distinguishing mugwort and ragweed. Any suggestions ? But really, my body knows ragweed and it’s not good. Gonna love me some antihistamines and indoor air! Goldenrod is also known under the name of Solidago and used mostly as a filler flower in floral arrangements. In small arrangements even each small branch of the Solidago is used. If its a huge Solidago head then it can be used as a flower. As florist I always love working with Solidago because it is so rich in color and can be used in so many ways in arrangements. Solidago is not the cause of allergies in general however individuals who are in general allergic to flowers could have problems with it too. There are two other flowers that are used in floral arrangements that I know of growing on the side of the road Queen Anns Lace and Septemberweed. Septemberweed is known by florists as Monte Casino and falls into the Aster family therefore also known as Monte Casino Aster and is usually white and sometimes can have a bit of a lilac tinge to it. I discovered, to my horror, the difference between Ragweed and Goldenrod pollen. I accidentally brushed up against Ragweed, the pollen, bright yellow, completely coated my jeans. My skin became instantly hot, the entire front of my upper thigh, both sides, eventually thickened to the point of being unable to be bent. It was horribly painful for several days and was tender for weeks. It was over a month for the torn skin (from the swelling) to fully heal. Be carefull when getting the pollen on you, if you react to ragweed with a sinus allergy, there’s a strong possibility it could cause skin problems as well, if not the first time, it may develop in time. Wash thoroughly after touching the pollen. I live in the country, and walking across a field, I can tell when Ragweed pollen touches my flesh because it starts to burn almost instantly. The flower on ragweed is inconspicuous, the pollen is very plentiful and powdery. Growing up, we grew Goldenrod behind our garage. I have no reaction to Goldenrod pollen. Goldenrod flowers make a nice fabric dye. Our neighbors eventually accepted our yellow flowers were not the allergen they presumed. Yes, Ragweed is Ferny and bushy. 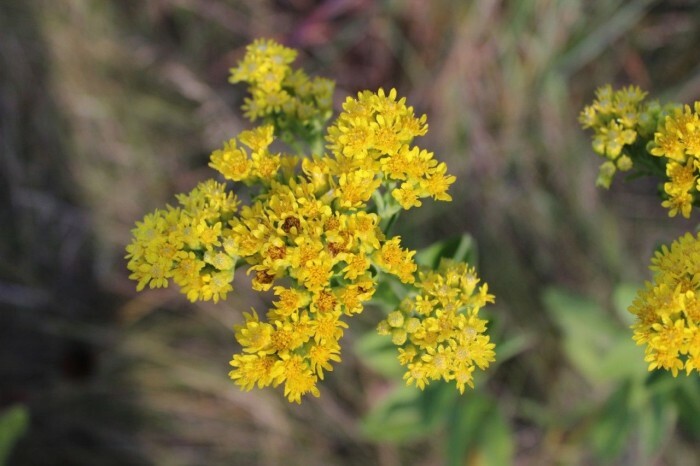 Goldenrod grows with a firecracker burst of flowers on a single stem. It is 3 to even 4 feet tall when cultivated with lots of water. Further, Goldenrod is insect-pollinated, not wind-pollinated like Ragweed. Ragweed is a horror. When you find it, pull it up, before! it blooms in late July early August. Thanks so much! I was having the same issues as you identifying what ragweed is because almost all the photos online show goldenrod. 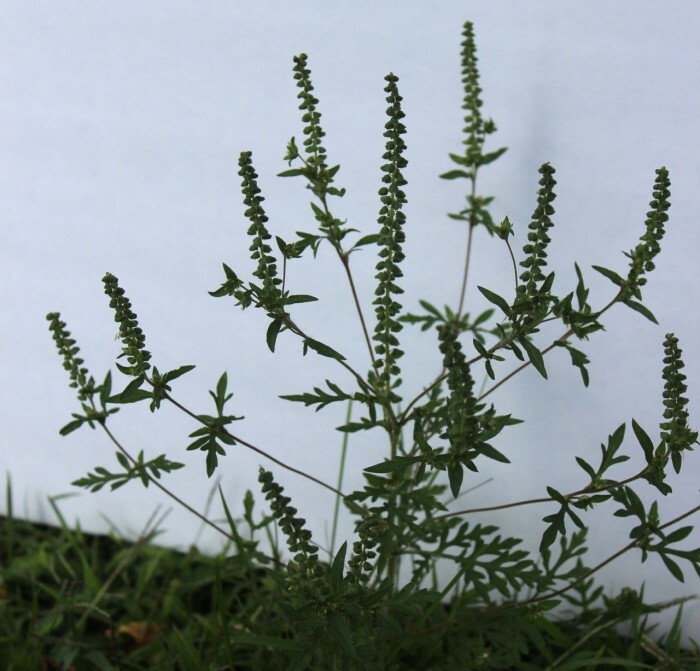 I also know what these hearty plants are that keep popping up around my yard; ragweed=(. This was a huge help for me and now I can continue to make my tincture, reassured that I definitely have goldenrod! 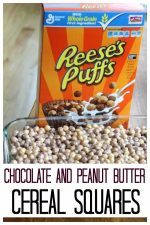 Thank you SO much for taking the time and dedication to make a post like this. I have scoured the internet for something easy, recognizable and definitive to give me a way to tell goldenrod from ragweed. Only your post fit the bill. Thanks again. Thank you!! I appreciate the work you put into this very much. As I was scrolling through this post again, I realized that the 2 pictures that say they’re the leaves of goldenrod, are likely not goldenrod, but some kind of member of the milkweed family. I apologize if I seem nit picky. I just don’t want to see people starting to mistake milkweed for goldenrod. I have goldenrod growing in my yard, if you’d like me to take some good, detailed pictures of the leaves for you, I certainly can. People always mistake goldenrod for ragweed and ragweed for mugwort. It drives me nuts when someone refers to goldenrod as ragweed! It almost makes me feel sorry the plant. Thank you for clearing this matter up. Someone needed to! Thank you for this very helpful information. My husband asked how to tell the difference. I. Could only point out the difference in the color of the flowers but that is of little help when you don’t know if the blooms are mature or not. Can you tell me the best way to eradicate the ragweed plants I do find? Thank you. One of the most informative sites on the topic. 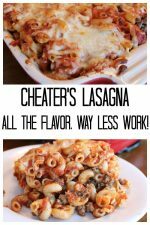 Your write-up along with pictures made this a great article. Thank you! My dog is terribly allergic to ragweed and I have to limit his outdoor time during ragweed season…I just realized I have been letting him walk on (and pee) on ragweed while steering him clear of Goldenrod! Your information will help immensely! Thank you so much for this article! I thought for so long that why I had out back was ragweed but in fact is actually goldenrod!! Thank you for your excellent description of the two plants. I just had an argument with some friends about this and wanted to see if I identified the 2 correctly and it is so. I have quite an eye identifying the unwanted plants in my yard. I sow wild cosmos in my garden in the spring and when they sprout so does the ragweed and it is quite a challenge distinguishing between the two because the leaves look very much alike. Only when they get taller is it easier to see the difference. So I have learned to recognize it very early. I love goldenrod and let it grow freely but I pull the ragweed. Thanks…….just what I was looking for…….. Monarchs love ragweed. The local teacher takes some of my seeds to plant for her school children to raise a monarch garden. The kids love it. So do I. I have a fenced off plot near my back door that is allowed to grow weeds that collect butterflys as well as the bright red and pink and flourescent white 4 o’clocks that attract pyramid moths. I have to tell you that what the teacher, the monarch and I call ragweed doesn’t look like this. Our ragweed has darker yellow brown centers and white petals. I was actually surprised that butterflys would go for something that was not too colorful. But they love them. I’ve never seen goldenrod around here but it is farm country and except for my ersatz ragweed, we do not encourage weeds in our pastures or yards. Thank you for this very useful information; particularly the pictures. 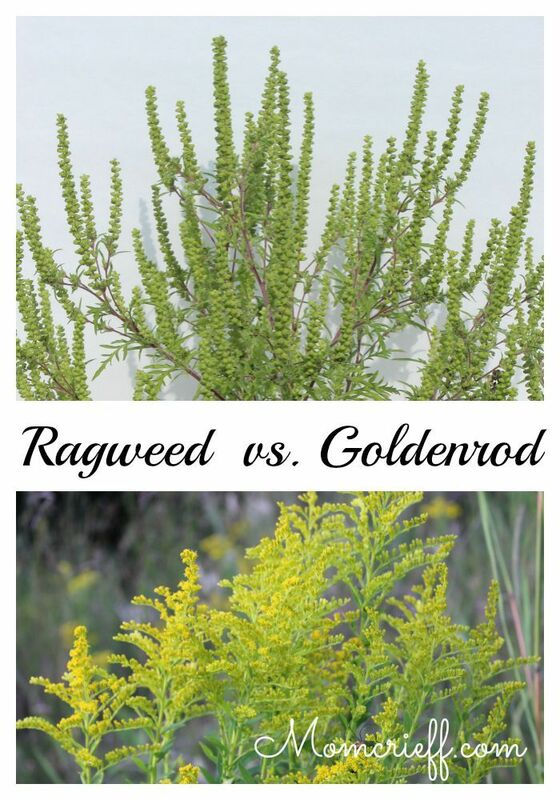 So much confusion between goldenrod and ragweed. I now know I have a volunteer goldenrod! I’ll let it flower but will probably pull it as it’s height and location hides much smaller plants! I am a little disturbed by the intrusion of DJDell’s comments re homeopathy though. It seems to me that those who do have a vested interest in homeopathy, (and therefore biased), support it. However, those who do not have a vested interest in homeopathy, and are completely UNbiased, have never been able to find any evidence that homeopathy works. As usual, there are always two sides to every story, and, for those interested, this is an unbiased link to information on homeopathy. To believe or to not believe … that is the question? Hi DJDell! I appreciate your comments. You are obviously passionate about what you say. Can you please e-mail me at susan@momcrieff.com so we can discuss this some more. Although homeopathic medicine has not been common-place in America for a while (slowly making a comeback, as are wild edibles) I come from a long line of homeopathic doctors and have come to learn and appreciate a lot about the so-called “weeds” around us, most of which are edible, natural medicine, far more nutricious than what you buy in the grocery story. In fact, after dumping the tea at the Boston Tea party colonists turned to goldenrod tea, and it was so popular and valuable they ended up additionally profiting from its demand by creating trade arrangements with Asia. Ambrosia means “food of the gods” and from ancient times was one of the highest prized foods and medicines – this is ragweed. The native Americans cultivated it. I consume both plants regularly and welcome them in my yard, among many others. Only in recent times have pollen allergies become more prevalent, likely both due to weakened immune systems and toxic elements in our environment that erode the covering that encloses the pollen allowing more to escape. But the leaf of the ragweed plant is entirely different from the pollen, and eating or making into a tea the leaf has been well known in natural circles for hundreds of years to halt the allergic reaction to the pollen. This is what homeopathy is all about – like cures like – sort of like vaccines but natural and healthier. Of course, I personally would not take herbs combined with any pharmaceutical/synthetic medications not knowing how they would interact, but since I only use plants as medicine that’s not an issue for me. I hope something here helps those suffering who have not found an effective treatment, and please research “wild edibles” and “plants as medicine.” Most plants including what we have deemed “weeds” are very valuable. For example, purslane which is a common small viney succulent that creeps along many garden bottoms tastes delicious and will give you all the Omega-3 / Omega-6 good oils you need, lambsquarters are a very common easy-to-identify weed with a white tuft of minerals on top and they taste just like spinach but are twice as nutritious, and there are many more examples. This is high quality, effective, free natural medicine and food. The only reason we have pharmaceutical medications that are perversions of nature concocted in a lab with dangerous side effects is because nature isn’t patentable – corporations have to alter is to make it patentable and thus profitable, and profit comes before your health. Thank so much for your great pictures and explanations! It was a big help. Glad I could help! It amazed me how hard it was to find someone to help me identify ragweed. Poor goldenrod seems to always get the blame. I am a sixty-year gardener and had to look at your post to see what is growing (and well) in my pollinator garden. Thanks for the definitive pics – now I know what to pull up! I feel so bad, as I have always blamed the autumn sniffles on goldenrod. The reason I checked it out finally, after all these years was the weather man said this would be a very long ragweed season. Thank you so much for your diligent work. I can officially say that I have ragweed to blame. I could have told you what ragweed looks like although I’ve never seen it blooming. I try to pull it up when it’s small. My ex is very smart about trees and weeds. He knows every tree by looking at the wood and we gardened. My knowledge is from him!!! I mostly identify from leaves. Hi, direct contact with goldenrod could cause a skin reaction, but the pollen is not carried by the wind, as with ragweed. I saw some goldenrod in a bouquet of mixed flowers, and thinking they were ragweed, I decided to inhale and find out if my sinus problems were due to allergies. I buried my face in the goldenrod, took a deep breath through my nose, and my sinuses instantly became so inflamed that I could not breathe for hours. Goldenrod may not be ragweed, but it is definitely the cause of my sinus headaches in this season. Great post. What about allergy shots for all of those of you who are suffering? I’ve been doing it for 17 mos. (just got to maintenance does about 6 weeks ago). The allergies are nowhere near gone but not nearly as bad as when they started a few years ago. Also read that several researchers (in Canada and Australia) are working on ragweed vaccines — so let’s pray for this as an end to our misery!! Lori, you have to tell by taking you or or children to an allergist, he will do small scratches on your skin, be it on your back or arms. … and then they will read it…if it becomes very itchy or your skin areas swell, depending on the serum they injected you with, they will be able to tell. Also, the Month of Sept is Golderod season! 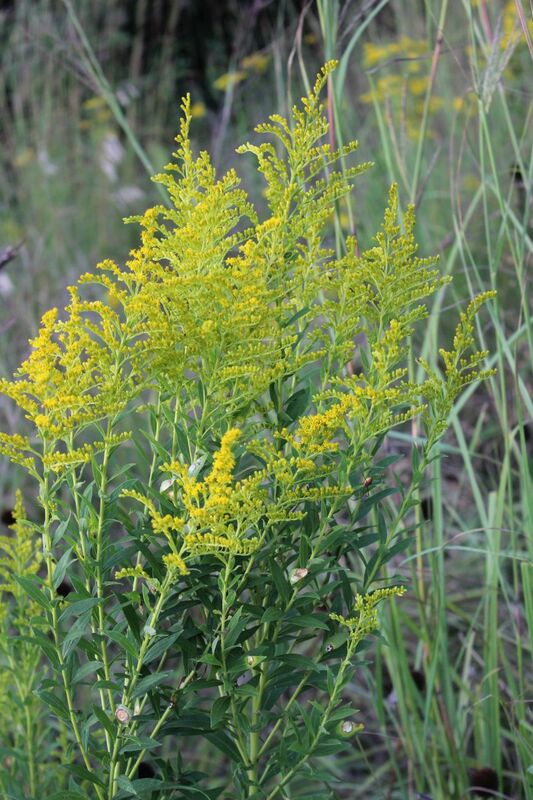 Poor goldenrod is too often blamed for allergies. Glad to have helped you! Thank you. I do have goldenrod!!!!!! Yea. Thank you so much, Susan. The second pic of the ragweed is a beautiful picture. No doubt about what that is! I have a weird thing growing outside my kitchen window. The only one of many little plants at the time, that seemed vigorous and cute. It is now bigger than I am and twice as round. It looks like a tree, but in the last two weeks is showing definite fake goldenrod tendencies. And it is covered with blooms and tiny little 1/2 inch leaves! Now that I know what it isn’t, I am dying to know what it is. The ‘trunk’ is like 2 1/2″ thick, like a giant sun flower. Don’t want to chop it down ’til I find out what it is! Anybody got any ideas? Thanks again! I hate allergies too! Benadryl makes me super drowsy. There are better allergy meds. that are over the counter. Talk to your pharmacist. They can help you find something better. Thank you for the nice comment! It was surprisingly hard for me to find someone to help me identify ragweed! I bet most people can’t! 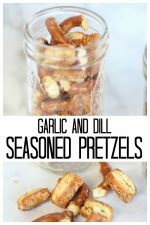 Best and most concise photos to be found! Thanks. Glad you clarified the mixed up pick on the Net. I found the same thing. So many photo of Goldenrod and calling ragweed. Goldenrod is actually a cure for allergies in tincture form. Its pollen is to large to be carried like ragweed. It’s not a problem plant like ragweed. You’re welcome. I think so many of us blame the poor ragweed! Thanks for this. Constantly confused. I’m a novice wildflower gardener. Am cultivating goldenrod and purple aster. 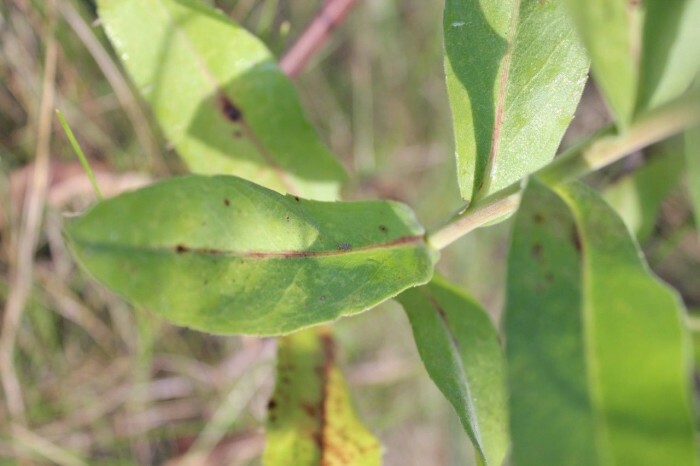 The close up pic of the goldenrod leaf you posted looks like purple aster to me — leaf bases fold around the stem. ??? Thanks for the great pictures, Its finally nice to see some concise information on this. From what I’ve read, the vast majority are allergic to ragweed. The pollen of ragweed is small, light and spreads by being wind blown. Goldenrod on the other hand has pollen that is big, heavy and sticky. It is spread by insects and normally doesn’t float in the air. Goldenrod gets blamed for people’s allergies because it blooms at the same time as ragweed and is what we see. I guess the only way to be sure is a real allergy test. But, in my mind the logic behind ragweed being the guilty one is sound. But the real question is, are you allergic to ragweed or goldenrod and how do you know? Alex and Emma are also suffering lately.